Briancon in France is a medium sized ski resort with 9 ski lifts (2 gondolas, 1 chair lift, 6 surface lifts) that offers skiers an incredible 1301 metres (4267 feet) of vertical descent. 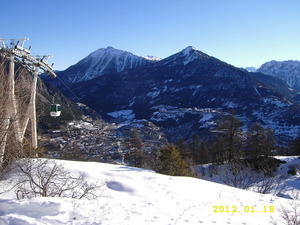 Briancon has 23 pistes. Briancon is best suited to advanced and intermediate skiers and snowboarders. We have no information about the existence of any cross country ski trails at Briancon. For snowboarders, there are 7 terrain parks and a half pipe. A small proportion of the pistes at Briancon are covered by snowmaking. Briancon is also known as Serre Chevalier 1200. It is now fully part of the extensive SC system and linked in by a fast gondola to the Prorel mountain. The lift company has invested 50 million Euros into new lifts over the past few years so there are rarely any queues and plenty of new fast 6 person chair lifts. We have skied, as a family, at Serre Chevalier for the past 20 years but have also skied at most of the big resorts in France, Switzerland and Austria over the past 30 years. We return to SC every year as the locals are so helpful, the ski area is 250km of piste and well linked plus the resort is very family friendly. Because of the 4000m+ peaks surrounding SC low cloud can't get into the valley, so the local claim of 300 days of sunshine per year is valid. It is generally either snowing or blue skies. The snow record is better than anywhere else I know in the Alps and there is plenty of good skiing for beginners to advanced. Briancon is a decent size town so has 2 big supermarkets to help keep costs reasonable. The 'old town' is medieval and has UNESCO World Heritage status. Staying in Briancon is the best option but try and get close to the main access point at the Prorel Gondola (google 'Briancon apartments'). I'd suggest self catering as the local hotels are not great and quite expensive. There are also swimming pools and a 1st Division Ice Hockey team that is well worth watching (Les Diables Rouge). The Italian border is only 15 minutes drive away if you want a 'genuine' Italian meal. If you want more variety the lift pass allows 1 days skiing at several other local French & Italian resorts (La Grave, Les Deux Alpes, Montgenevre, Claviere, Sestriere, Puy St Vincent & Souze d'Oulx).